I’d hate to say you have to be a cat owner/lover/admirer to appreciate this children’s book. But the truth is, part of what makes is so funny is the absolutely brilliant way the author captures the contradictory and hilarious behavior of cats. They are both brilliant and perhaps dumb at the same time, and totally lovable. 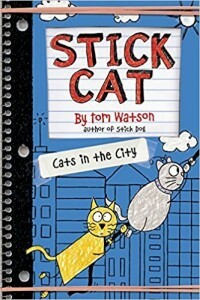 This is the second children’s book about cats by the author, who usually writes about dogs. In my opinion, it’s even better than the first. I laughed my way from start to finish, and it is a quick read. I also want to admire the way something that might appear to be light-weight, almost comic book style, (though far fewer illustrations), can actually be profound. In this children’s book, one of the cats has the patience and intelligence of a saint, while the other is gloriously scatterbrained and ego-centric. Almost like reading an Aesop’s fable, we get to see first hand how one can handle someone else’s insanity with grace and integrity. I was fascinated at the characters of the two cats, and what a wonderful teaching this children’s book offers. The lesson is so handled with a big spoonful of sugar, but it is profoundly accurate: responding with kindness always works. What was fascinating to me was that I was personally going through handling some difficult people, and reading this book lightened the whole thing up considerably. There is at least one more book in the series that I look forward to reading.